If you are looking for information on the Wild About Harry's franchise business opportunity, Wild About Harry's franchises or Wild About Harry's franchising, then you have come to the right place. Scoop up a delicious opportunity. Have you dreamed about owning your own business? Have you always wanted a feel-good job, one that will make you proud? Owning a Wild About Harry's franchise could be the gratifying career opportunity you've been looking for. With 13.5 billion spent per year on ice cream in shops and retail outlets, America has a hankering that we're ready to satisfy. Ice cream and related frozen desserts are consumed by more than 90 percent of U.S. households. 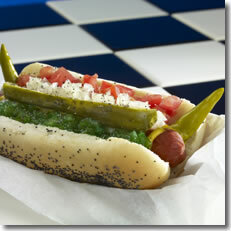 If that doesn't get your mouth watering, Americans consumed approximately twenty billion hot dogs last year alone. 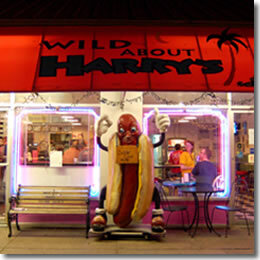 Wild About Harry's traces its roots to the childhood of its founder, Harry Coley in Hollis, Oklahoma. Harry's mom, Sarah Frances, made a special treat called frozen custard. It was like ice cream, only better. 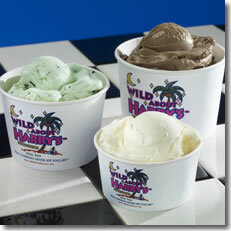 Harry decided at a young age to share his mom's custard with the world, and he fulfilled that dream in 1996, when Wild About Harry's opened on Knox Street in Dallas. Harry's mission is to focus on the family and the community we live in. Wild About Harry's brings fun, quality food and a caring environment into our lives, making everyone's day a little brighter. We do that by making some of the best food around, like our delicious hot dogs that are made from all-beef lean brisket and premium fixings. Customers can choose from a selection of lip-smacking varieties, ranging from traditional Chicago-style to those with our own Southwest flair: the Chihuahua, Junkyard and Firedogs. And we offer veggie dogs, too. Our frozen custard comes in 50 delectable flavors. We offer perennial favorites such as vanilla, chocolate, coffee and coconut and a rotating selection of exciting flavors, including Chocolate Mint, German Chocolate, Dreamsicle and Peach. We also offer many of our more popular flavors sugar-free. Hand-dipped and made fresh every day, customers can choose from an array of mouth-watering menu options - scoops, cones, sundaes, shakes and concretes. An opportunity you'll be wild about. "Harry Coley is the Colonel Sanders of frozen custard. His amiable, grandfatherly ways and the down-to-earth deliciousness of his hot dogs and custard have made Dallas wild about Harry." To be considered as a franchise owner, applicants should have an entrepreneurial spirit and a community-based business philosophy. We're looking for honest, enthusiastic individuals with the skills to lead a team of employees and the desire to make people happy! Comprehensive training at our headquarters. We'll share the important details critical to your operation such as: food recipes and preparation, administrative and operational procedures, purchasing and customer service. You'll also receive periodic on-site visits. Our complete and confidential operations manual. This easy-to-follow guide will be an invaluable tool long into the future. Our singular software system to run your business smoothly and efficiently. Help with purchasing, including assistance with selecting specialized custard-preparation and serving equipment, suppliers, ordering, and inventory control. Marketing assistance, including the Wild About Harry's website. Filled with our menu and catering information as well as fun-facts about our restaurant, our web site is a 24-hour advertisement for your franchise unit. Phone and e-mail support to answer any question that should come up.